Almost every phase of international trade and the activities and costs related to it are up for negotiation, including pricing, charges, customs duties, shipping and insurance. Each of these problems must be adjusted between exporters and importers to precisely determine which party is lawfully responsible for each particular aspect of the trade deal. Disparities in language and culture can complicate these conversations. To improve disclosure and alleviate the risks of confusions, the ICC developed INCOTERMS (International Commercial Terms) to work as universal trade representations. It is now far more comfortable for trading partners in different languages and from different cultures to do the business. Costs: Who pays for the many shipping expenses (packing, moving, duties) met throughout a shipment’s route? Ownership/Responsibility: At several points of the shipment’s route, which individual owns the goods and takes up the risk? Liability: If goods are injured, who is liable for paying losses, and at what stage? Each INCOTERM is indicated by a three-letter abbreviation, and they are normally listed by division. EXW — Ex Works: The exporter’s least responsibility is to get the goods ready at the defined place. The importer takes all other risks and expenses. FCA — Free Carrier: The exporter ensures the goods are made ready for the importer’s named carrier at a specific decided location. The importer then assumes all risks and expenses. CPT — Carriage Paid To: The exporter pays the freight to a named stop. The importer then assumes all risks and expenses. CIP — Carriage and Insurance Paid To: Same as for CPT, but the exporter must also furnish insurance. The importer then takes all risks and expenses. DAT — Delivered to Terminal or Port (Applied for ocean or inland waterway shipping or multimodal shipping): The exporter pays all transport charges to a named port but does not free the goods through customs. The importer then takes all risks and expenses. DAP — Delivered at Place (Applied for all mediums of transport, as long as the last shipment to the defined place is by land): The exporter’s obligations end when the goods are transferred to the named place. The importer is responsible for clearing customs. The importer assumes all risks and expenses from this point on. DDP — Delivered Duty Paid: The exporter pays all charges, including customs clearance, relevant duty/taxes, and delivery payments, to the importer’s specified delivery address. FAS — Free Alongside Ship: The exporter’s duties are fulfilled when the goods have been delivered alongside the main ship at the dock or defined the port. The importer then takes all risks and expenses. FOB — Free on Board: The exporter’s duties are achieved when the goods are delivered on board the ship. The importer then takes all risks and expenses. CFR — Cost and Freight: The exporter pays all costs required to move the goods to the specified destination. Risks are shifted to the importer when the goods cross the ship’s rails. CIF — Cost Insurance Freight: Same as for CFR, but the exporter must also give marine insurance. Each of these terms reflects differing degrees of cost and risk and sets the balance of duties between the importer and the exporter. Departure, main carriage due and the main carriage paid-INCOTERMS are all shipment deals. In these, the exporter delivers simply by transferring the contract goods to a carrier somewhere on the exporter’s side. Determined by the terms, the location could be the exporter’s premises, a carrier’s terminal, and a forwarder’s storehouse, or alongside or on board a ship. The requirement for payment to be made to the exporter is identified as soon as this delivery happens. Terms starting with the alphabet ‘E’ mean that the exporter’s duties are achieved when the goods are made ready for transportation by the importer’s preferred carrier. Terms starting with the alphabet ‘F’ apply to shipments where the primary charge of shipping is not paid for by the exporter. Terms starting with the alphabet ‘C’ apply to shipments where the exporter pays for a part of the transportation but the exporter’s duty terminates when the goods are transferred to the carrier someplace on the exporter’s side. Terms starting with the alphabet ‘D’ are destination agreement terms because the exporter delivers someplace on the importer’s side. The shipper or exporter’s duty stops when the goods arrive at a named point. Delivery on the importer’s side means that acceptance of payment is delayed. It is advisable for entrepreneurs to grow accustomed to INCOTERMS to correctly and clearly know what rights they are authorized to and duties they are responsible for when shipping goods internationally. This, in turn, can assist them to determine the insurance provisions compatible with their business requirements. 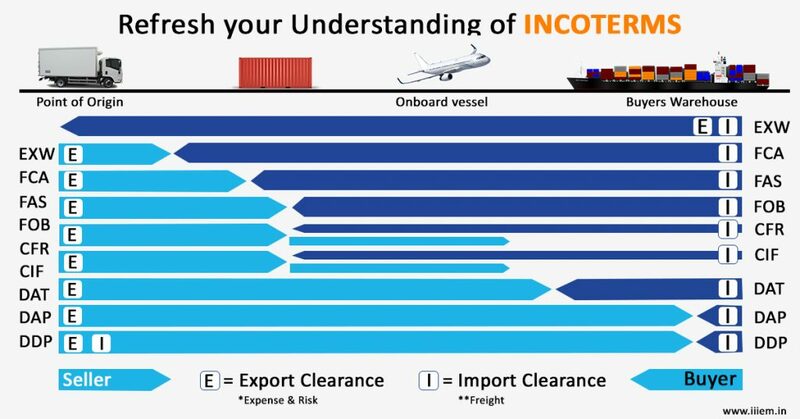 What other information or learning about INCOTERMS do you think are important to become proficient with them? Let us know in the comments below.